Poll Results – What e-Reader is the Most Desirable for the Holidays? You are here: Home / e-Reader News / Poll Results – What e-Reader is the Most Desirable for the Holidays? The march to the holiday season is upon us and e-reader companies have all revealed their complete product lineup. There is a ton of different models to choose from and sometimes it may be difficult to make an informed buying decision. We ran a poll on Good e-Reader from September 15th to September 29th 2014 and people all over the world weighed on what was most appealing. During our polling period 1,221 people cast their vote and by a landslide the new Kindle Voyage and Kindle Basic with a touchscreen won with over 469 votes. This really drives home the point that readers everywhere prefer the Amazon line of devices and something is really compelling about their new product lineup. 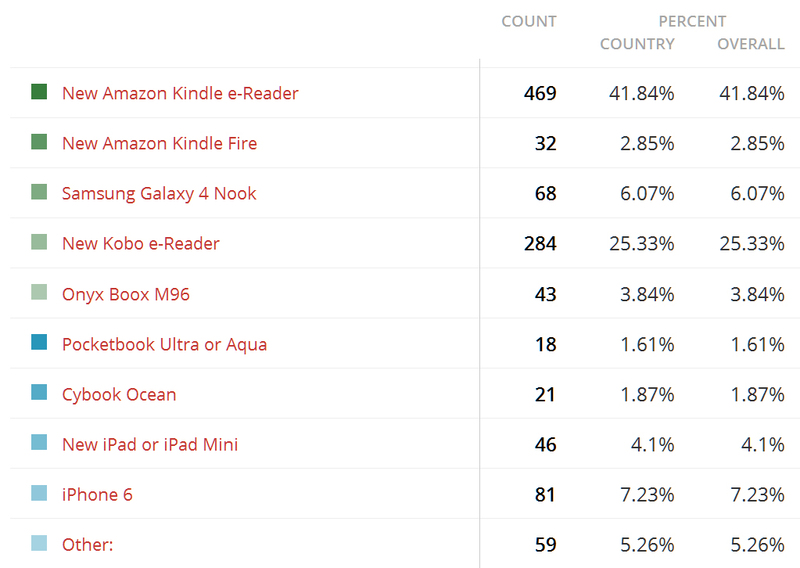 In second place with 284 votes was the first waterproof e-reader to be issued by a mainstream company, the Kobo H2O. This device features a very vibrant 6.8 inch display and can be used on the beach, bath or on vacation. For the first time ever, literary fiends will be able to use their device in all environments. 3rd place is where the field got fairly even with the iPhone 6 and 6 Plus garnering 81 votes, followed by the first tablet that Barnes and Noble has issued in awhile, the Samsung Galaxy Tab 4 Nook. The full list of devices and statistics are in the above picture, so I want go into much more details. What surprised me the most though, was the fact there is a severe lack of demand for the next generation Kindle Fire tablets. Amazon made a huge announcement with five new devices, one appealing to kids and others hitting every conceivable price point possible. Only 32 people had any sort of plans to upgrade to or buy one for the first time.